Decision: Which fighter is better - Narvia or Turosh? Which would you rather eat: A) a room-temperature sandwich bag full of turkey giblets that you found on the bathroom floor or B) A sponge soaked in the neck sweat of a horse that's dying of dysentery? Seriously though, Narvia is better. Let's just get it out of the way. Narvia and Turosh are not good models. But, as with the Gitz archers, if you choose to play Eyes of the Nine, you're stuck with them. Prior to the release of Nighvault (or Shadespire 2: Nightvault, as we call it here), the vast majority of the 2 health models in the game were resurrectable by either the Sepulchral Warden or Skritch. The two that weren't recyclable were both in Garrek's Reavers and were widely considered to be the worst models in the worst warband. The two health models added after Nightvault aren't resurrectable, but they do all have a mobility trick in the form of Scurry or a "commander" effect from Drizgit or Varclav - except for these two. Overall, Turosh and Narvia have poor defenses, weak attacks, and a less than stellar inspire condition on top of their low health, leaving them at or near the bottom of the pile for fighters. With that in mind, let's take a look at the twin kairic acolytes to try to determine which one is the shiniest turd. Narvia and Turosh are similar in a lot of ways - wounds, movement, and inspire condition. So we won't really be looking at those. Instead we'll be focusing on the differences between the two. One area that a difference is immediately apparent is in defense dice. In both her uninspired and inspired versions, Narvia rolls a single block die, while Turosh rolls one dodge die on both sides. Essentially, when called upon to defend, Narvia will roll a success on 17% more of her rolls than Turosh. It's worth noting that neither 1 die defense is particularly reliable at defending, and both acolytes are likely to take a dirt nap if attacked by a model with a strong attack. Nonetheless, in the defense department, Narvia is the clear winner. (Insert near-mandatory disclaimer about Cleave reversing the likelihood of successful defense here, before someone makes the ludicrous argument that Turosh is a better defender). 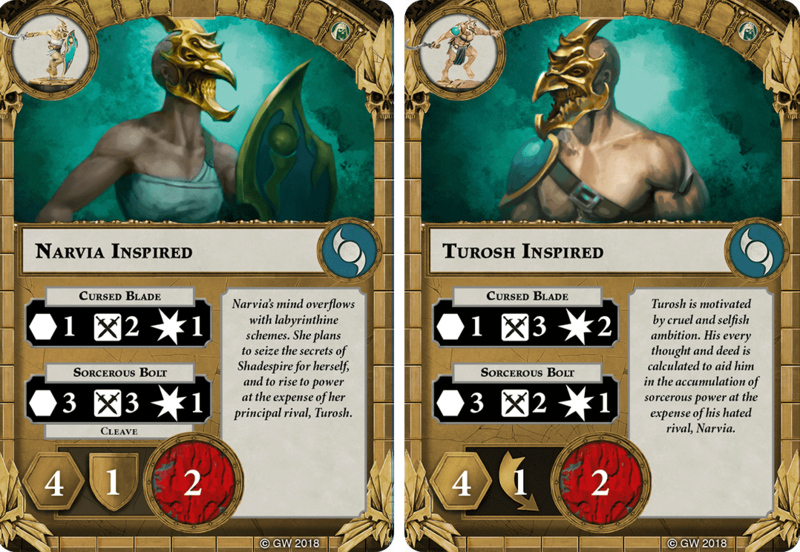 Here, Turosh has a definitive advantage in both the inspired and uninspired state. At the beginning of the game, Turosh's version of Cursed Blade is no more likely to hit, but deals twice as much damage per average unblocked use as Narvia's. Neither one is particularly accurate at 2 swords, but Turosh is definitely the better melee choice. 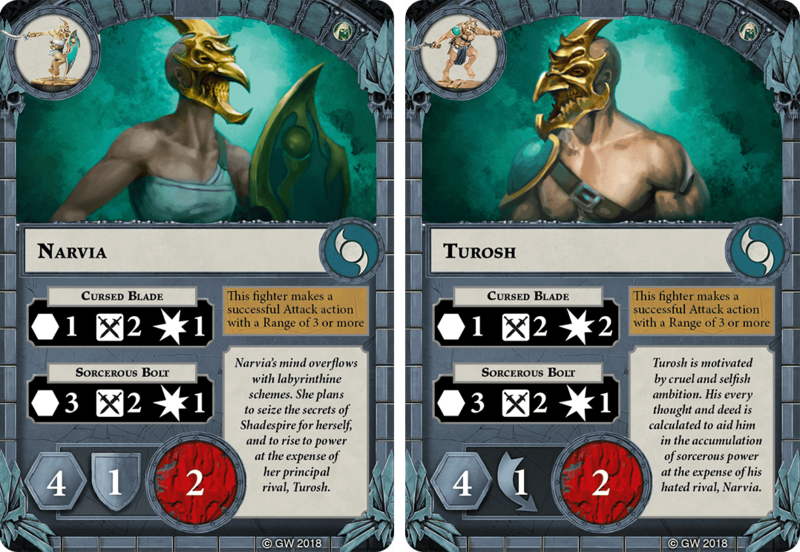 After inspiring, the differential becomes greater, as Turosh's Cursed Blade improves to 1-3-2 and Narvia's stays at a paltry 1-2-1. This improvement pushes Turosh ahead by almost a full point of damage per average unblocked use (1.4074 vs. 0.5556). Turosh is the clear winner here. In terms of ranged attacks, the two models start off with the same ability, a 3-2-1 sword attack that leaves something to be desired, compared to the game's premier ranged attackers - the Farstriders. Upon inspiring, though, Narvia's version of Sorcerous Bolt improves to be better than not only Turosh's, but also better than the Farstriders' Boltstorm Pistol. Even before calculating the effect of cleave, Narvia's Sorcerous Bolt will outdamage Turosh's version by about 20% per average unblocked use. 3-die attacks critical over 40% of the time, and coupled with Cleave, Sorcerous Bolt becomes extremely powerful against Block based warbands. Narvia picks up another point here on her quest to become the best smelling leper. 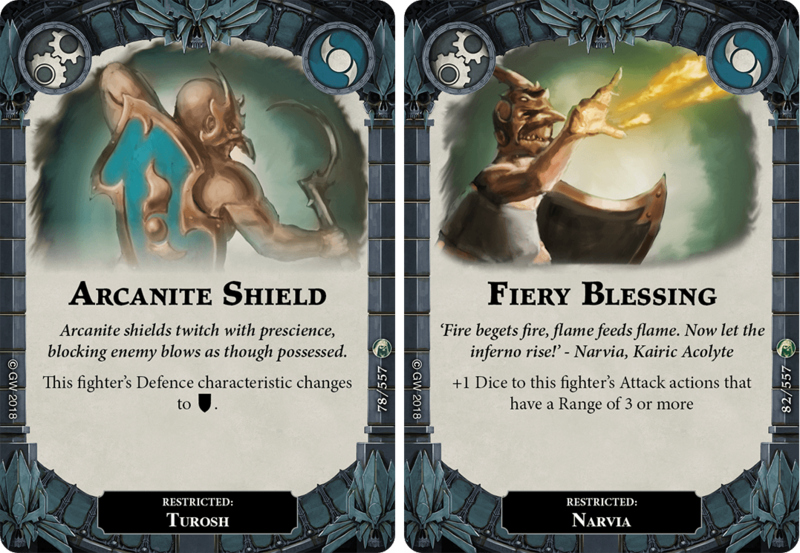 The two kairic acolytes have only 1 exclusive upgrade each: Arcanite Shield for Turosh and Fiery Blessing for Narvia. Arcanite Shield is a straightforward improvement to Turosh's defense that brings that stat in line with Narvia's. This can be quite beneficial, as noted in a previous article. However, it should be pointed out that 1 die defenses benefit the least from the upgrade from Dodge to Block, and are the only instance where gaining an extra die would be more beneficial in terms of raw success than converting to the more common success condition. Fiery Blessing serves not to shore up Narvia's weaknesses, but instead push her further ahead in terms of ranged attacks. Upgrading Sorcerous Bolt to a 3-4-1 sword attack after inspiration means that it will critical over half the time, and further pushes the advantage of multiple successes against Block warbands. In terms of universal and generic upgrades, the two models have equal access, but gain disparate benefits. Some benefits are obvious, such as Turosh's ability to use Acrobatic effectively. Others are more subtle; Narvia gains significantly more benefit from Scroll of the Dark Arts than her counterpart. Ultimately, universal upgrades are essentially a wash. In the end, upgrades would probably be a toss-up were it not for the existence of Ethereal Shield. Unfortunately for Turosh, his only exclusive upgrade is just a worse version of Ethereal Shield. Unlike some exclusive upgrades (Strength of Arrogance, for example), playing both on the same model doesn't net you any improvement. Certainly you could play both for consistency, but using two slots to grant a mild improvement to a bad model's poor defense stat doesn't seem like the best plan. Narvia's upgrade, on the other hand, improves her ranged attack accuracy more than any other currently available upgrade - including the much vaunted Awakened Weapon (she can also benefit from having both upgrades). Narvia has the advantage - however slight it may be - in access to upgrades. As mentioned here and elsewhere, when you choose a warband, you're stuck with their models - for good or bad. So it doesn't make a ton of sense to present alternate options to specific models within a warband. However, comparison to other models can still serve a purpose. In this section, we'll use a different method of evaluating Turosh and Narvia: by determining how many glory we would have to spend to bring the humble Dibbz up to their level (in this case, we'll be using the inspired side of all models, as that is where the kairic acolytes differ most clearly). Dibbz is a bad model; we've already covered that. He's even worse than Narvia or Turosh in most ways. However, Dibbz only accounts for 1/9 of your warband, where the kairic acolytes each compose 1/5 of theirs. So it makes sense that Dibbz would need a bit of a boost to match Turosh or Narvia (for the moment, we'll ignore the fact that inspired Dibbz is a better defender than either acolyte). First, we'll look at Turosh. Dibbz and Turosh have the same movement, health, and ranged attack, so that's easy. They use the same defense die type, so Dibbz doesn't have to step it up any there. What Dibbz does need is a melee attack, which is easy enough to come by through the use of "weapon" type upgrades. 1-3-2 sword attacks are fairly common for weapons to grant, though they usually throw in an extra benefit for the cost of a glory. 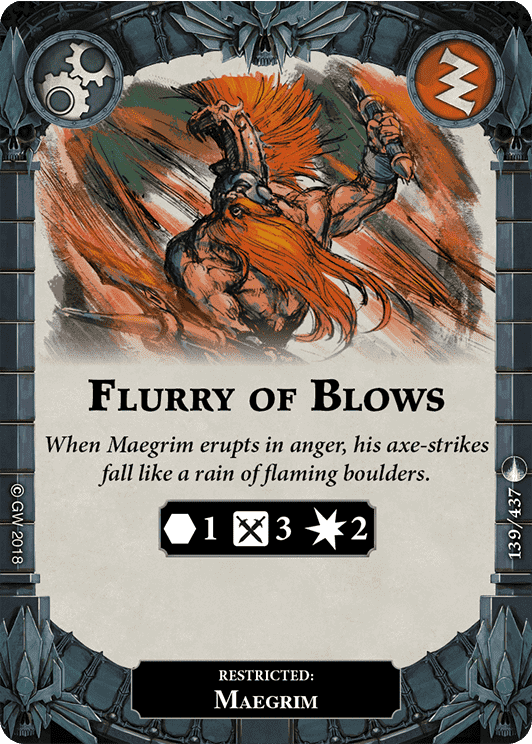 One, however, does match Turosh's Cursed Blade exactly - Flurry of Blows. It's exclusive to Maegrim, but we're living in a hypothetical world right now, and it fits the bill precisely. 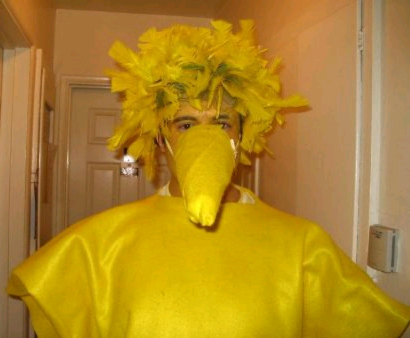 Once Dibbz equips it, he's Turosh's equal in every way. On to Narvia - what will Dibbz need to compete with the female kairic acolyte? His 2 die dodge defense is actually better than Narvia's, though not by the same margin that it's better than Turosh's. He moves and takes wounds at the same level too. Unfortunately, Grot Bow just isn't up to the level of Sorcerous Bolt. In order to close the gap, Dibbz will need an additional attack die and cleave. 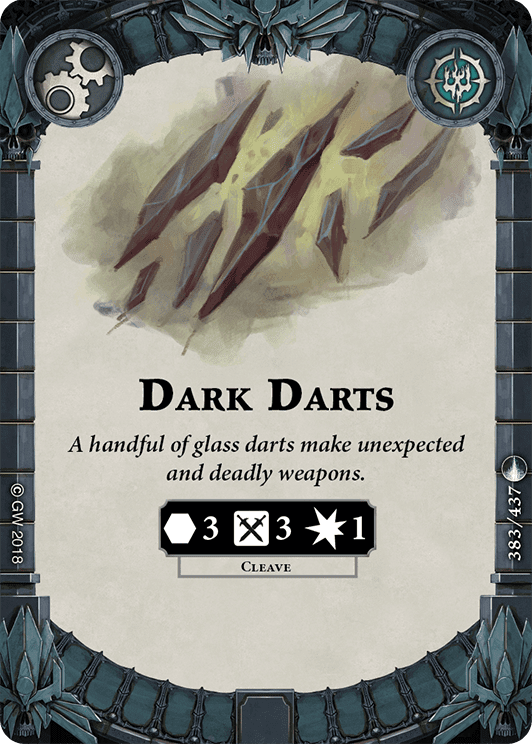 Fortunately, that's easy to pick up in the form of Dark Darts. Still, Dibbz needs to pick up a 1-2-1 sword attack to equal Narvia. This one is harder to do. There are numerous upgrades that provide this kind of attack, but all of them also provide significant additional benefits like rerolls, pushes, or additional activation abilities. This kind of attack is just too bad to spend a whole glory on. So no matter what upgrade Dibbz picks up for a melee attack, it would be better than Narvias. Narvia's melee attack isn't worth a glory point - but maybe it's worth part of one. Even with this complication, however, it's clear to see that Narvia is stronger than Turosh when the two are compared to Dibbz. 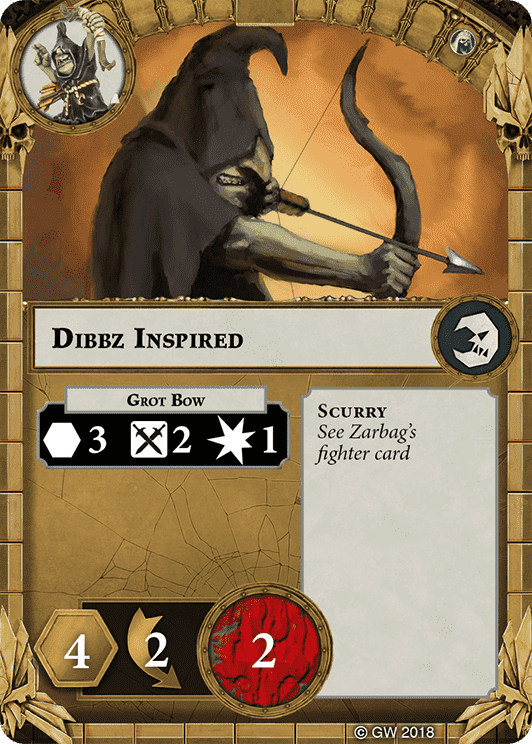 A single glory point brings Dibbz directly in line with Turosh, and that's using a less-than-stellar upgrade with your glory. To reach Narvia's level, Dibbz needs to spend a full glory point and then some imaginary fraction of one to purchase a really bad melee attack. No matter what the fraction is, the 1.X glory required to equal Narvia is more of an upgrade cost than 1 required to equal Turosh. So who's the better of the kairic acolytes? In terms of raw numbers from the Dibbz challenge, it would appear that Narvia has a clear lead. Turosh's melee capability is clearly better on both sides of his card, which may lead some to say he is the better model. It's worth considering context though - how likely is Turosh going to be survive melee combat? With a single dodge die and 2 wounds, not very likely. Both models are obviously better suited to staying out of the way and using ranged attacks (it's how they inspire, for one). When we consider Narvia's superior defense and better ranged attack along with her slightly better access to upgrades, it becomes clear that Narvia is the Top Model. So charge in with Turosh hope he connects and then dies so that Narvia scores choosen by destiny for 1 glory. Absolutely! Throw in a Trap or Twist and Turosh might actually kill someone. I wouldn't plan on him ever inspiring.